We treat All PESTS, from Ants, Spiders and Termites, to Wasps & All in between. When making a Booking or requesting a Quote, select the pest or service in the drop down menu that needs eradicating. BEES our specialty. 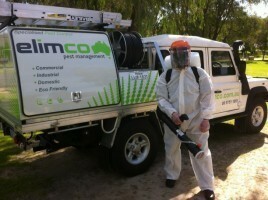 ELIMCO Pty Ltd, is a Domestic and Commercial Specific Pest Management Company, operating in the South West. Our equipment is based upon the latest technology, meeting the highest standards and we have over 25 years of experiencein the Pest Management Industry. Our revolutionary approach to pest management can benefit any organisation in PERTH and the South West. ELIMCO is able to solve potential pest problems by introducing Pest Management Programs. We are backed by our suppliers and loyal customers. Our aim is to deliver results, using tailor made programs, geared to suit any environment without doing harm to that environment. We pride ourselves on being eco-friendly. Our approach is to provide a professional, economic and effective service. Our techniques remain discreet, yet never compromising on a safe environment, both for customers and our staff. …..to ensure that your system remain economic, efficient and effective.